This is not your grandmother's Sam's Club. Spending the weekend shopping at a big box store like Costco and BJ's can be super rewarding (so many deals! ), but also super tiring when everyone else has the same idea and the checkout line feels like it's 10 miles long. One membership-based retailer company is changing things up by completely cutting out the cashier — and it's making jaws drop. Sam's Club, which is owned by Walmart, will soon open a new store in Dallas, Texas, that will not have any cashiers, according to a statement by the company on Monday. In January, the first Amazon Go store without cashiers opened in Seattle. There are now six Amazon Go stores in Seattle, Chicago and San Francisco, so the new Sam's Club store will be the latest competitor in the digital grocery store wars. Named Sam's Club Now, the store will be 32,000-square-feet, which is approximately a quarter of the size of a standard Sam's Club store. Customers will only be able to pay using a new Sam's Club Now app that is based upon the company's Scan & Go application. People will use the app to scan in the bar codes of items and pay for them, but that doesn't mean that the store will be completely unattended. Employees that the company calls "member hosts" will be on on-site to help people navigate the store, so it's not like no one will be around to help customers find the toilet paper, paper towels and 140-count of frozen pigs in blankets. The company did not mention how many cashiers are usually employed at Sam's Club locations and how many member hosts are expected to staff the new Sam's Club Now store. The new big box store will be a technology testing ground, according to the company. The app will have a feature that helps customers make a shopping list and it will also have voice search capability that can be used to locate products throughout the store. Another tech update is that the shelf labels will be electronic and automatically update, which should eliminate the need to print new labels when prices change. Also, members will be able to order items for pickup from the store within one hour. The new store will also use augmented reality to show customers new uses for different products, for example. If it feels like this is some strange version of reality, that's because it kind of is. "We also have plans to use augmented reality to transform members’ digital carts into pirate ships," according to the company's statement. "Or maybe you'd prefer a rocket? More on that soon!" Sam's Club didn't elaborate on its puzzling pirate ship and rocket comment, but fingers crossed that a virtual reality situation is on the horizon. Now, that could make big box shopping way more fun. 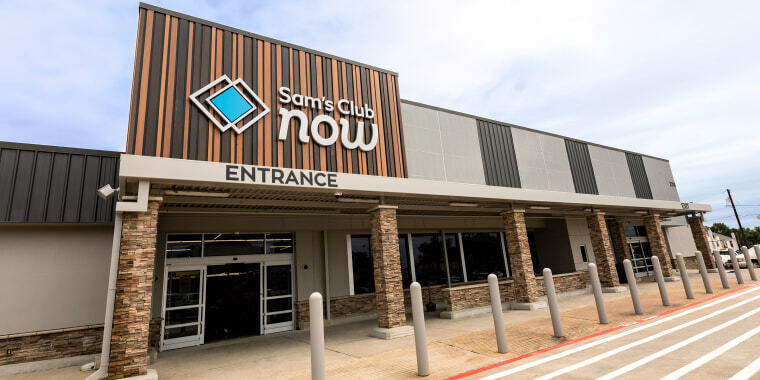 The company hasn't announced an exact opening date of Sam's Club Now, but if the test store becomes a hit, there's a good chance that a trip to a big box store will be a little bit less crazy. Amazon vs. Instacart: Which grocery store delivery is better?